An individual’s emissions, taken separately, do not appear to have any consequences. Since these emissions do not appear to make any significant difference to climate change or its harmful effects, they seem entirely faultless. However, is it really true that the effects of an individual’s greenhouse gas emissions are insignificant? To answer this question, let me first briefly give an overview of the process of climate change. The Earth receives energy or heat from the sun, and its surface radiates this energy back into space. However, an important part of this energy does not arrive into space, but is absorbed by greenhouse gases in the atmosphere (such as water vapour, carbon dioxide and methane), warming up the atmosphere and the Earth’s surface. This greenhouse effect is critical to support life. The greenhouse effect relies on a precarious balance between the sources of greenhouse gases (such as animal and plant respiration, soil decomposition and the exchange of carbon dioxide with the oceans) and the sinks (trees, plants, soil, dissolution in the oceans and the uptake by marine plants and animals) that take up and store greenhouse gases. Since the beginning of the Industrial Revolution, humanity has started unearthing and burning fossil fuels (carbon stored in the earth in the form of coal, gas and oil), emitting vast amounts of carbon dioxide. Land and ocean sinks are not capable of taking up this massive amount of anthropogenic greenhouse gases. As a consequence, greenhouse gases accumulate in the atmosphere, intensifying the greenhouse effect, and causing global warming. Increasing global temperatures cause sea level rise and climatic changes (such as changes in precipitation patterns, the increased frequency and intensity of heat waves, drought, floods and storms). These effects in turn exacerbate the risks vulnerable people (now and in the future) are exposed to, increasing mortality, threatening human security, exacerbating the spread of diseases, and increasing existing food and water insecurity. Of course it is not. Exactly the emissions of those 7 billion people cause climate change. (3) Therefore, it is tempting to construe climate change as a problem of collective responsibility. Although I do not deny the fact that climate change has become such a large pr oblem because of the accumulation of so many individual greenhouse gas emissions, I do not believe that we first need a complicated philosophical account of collective responsibility in order to derive individual responsibility for climate change harms from it. As our point of departure, we should rather focus on the fact that each greenhouse gas emission has a fully real ­– albeit exceedingly small – effect in that it increases the risk of climate change harms by a fraction. Against this, Dale Jamieson and others have objected that it is impossible to trace the effect of a particular greenhouse gas molecule due to the complexity of the causal process of climate change. (4) Climate change is indeed extremely complex, but I cannot see why we would have to trace a particular greenhouse gas molecule all the way in order to judge that its emission increases the risk of climate change harms. For example, it might be true that only some of the greenhouse gases emitted by individuals remain in the atmosphere, absorbing energy and causing global warming. Other emissions are taken up by land and ocean sinks. However, the latter also contribute to climate change because they deplete the capacity of sinks to absorb greenhouse gases. What really matters, is that the amount of greenhouse gases emitted by the individual is not zero, and our knowledge about the physical properties of these gases as well as the processes of global warming and climate change is sufficiently developed to judge that even a miniscule addition of greenhouse gases provides a tiny but real contribution to global warming. In sum, individual greenhouse gas emissions have an exceedingly small but fully real effect in that they increase the risk that vulnerable people suffer from climate change harms. Nonetheless, the fact that this effect is tiny remains problematic for different reasons: it appears that individual emissions are neither sufficient nor necessary to cause climate change. I will address this view in the following post. (1) For the sake of advertisement: my colleagues and I have included some of the arguments in this series in our book Climate change and individual responsibility: Agency, moral disengagement and the motivational gap (Basingstoke: Palgrave MacMillan, 2015). (2) I owe this phrasing to Avram Hiller: ‘Climate change and individual responsibility’, The Monist 94 (2011), pp. 349-68, at 349. (3) On the occasion of the publication of the Working Group 1 contribution to the IPCC’s Fifth Assessment Report in 2013, the satirical news website The Onion carried the headline ‘New report finds climate change caused by 7 billion key individuals’. (4) Dale Jamieson, Reason in a dark time. Why the struggle against climate change failed – and what it means for our future (Oxford: University Press, 2014), pp. 180-1. (5) John Broome, Climate matters: Ethics in a warming world (New York: W. W. Norton & Company, 2012), p. 75. This figure is based on an unpublished paper (‘Ethics and personal carbon footprints’) by David Frame. (6) Catriona McKinnon, Climate change and future justice: Precaution, compensation and Triage (Abingdon: Routledge, 2012), p. 103. Hi Wouter, thanks for this post. I think I agree with the general thrust of your argument – saying, basically, that there is nothing special about climate change compared to other moral harms that come about through collective action. What I’ve been wondering about is the role of institutions: we are born into a situation in which high CO2 emissions seem to be part of a normal human life, even at rather low levels of income and consumption. 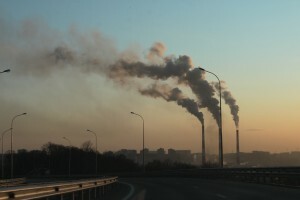 Part of the psychological resistance to seeing oneself as responsible for climate change might stem not only from the fact that individual contributions to emissions are small, but also from the fact that no individual feels responsible for the institutional structure that puts us into a situation in which high emission levels are “normal”. So I was wondering whether the relevant “problem of smallness”, as you might call it, isn’t ALSO the seeming smallness, and hence seeming futility, of our contributions to changing institutional structures? Thank you very much for your comments, Lisa. I think I will address your questions in following posts (this is of course a disadvantage of trying to tackle such a large issue, and of writing a series of posts – my apologies), but I will already try to give an indication of my views. I believe you raise two separate issues. First is the problem that people are compelled to emit greenhouse gases due to the carbon-dependence of the economy. I believe this is a valid argument to exonerate individuals from responsibility for a part of their emissions (what Henry Shue calls “subsistence emissions”). We can discuss the definition of subsistence emissions etcetera, but there is a significant amount of emissions that individuals can easily avoid by behavioural changes, and for which feasible alternatives are present. Although you are probably right that I should have already mentioned this from the beginning, I will address this issue more into detail in the fourth post, if I may. The second problem you raise is the apparent futility of our efforts to change institutional structures. I will take this up in the third post, but I would already like to say that some philosophers argue that since individual efforts to reduce greenhouse gases do not make a difference to climate change, our first duties are to promote just collective institutions to tackle climate change. Your point is important because it shows that this argument is biased: since our contributions to changing institutional structures are exceedingly small as well, these “promotional” duties should be criticised with the same arguments those authors use to criticise individual duties to reduce emissions. In contrast, similar to the effects of individual emissions, I would maintain that even though individual political actions have an exceedingly small effect, their contribution is nonetheless fully real. Thanks for your reply, and my apologies for being impatient. I share your view that the “too small to make a difference”-argument holds in neither case. The psychological mechanisms might be quite different in both, though. So I look forward to the post in which you address this! Thanks for this post, Wouter. Like Lisa, I am sympathetic to the general direction of this post, but I have two small questions for you. First, how would you respond to Broome if he were to say not that an individual’s contribution is not noticeable, but instead that an individual’s contribution ought not to be recognised as harm, given that it is so insignificant by itself? On this interpretation, when Broome says ‘noticeable’, he ‘noticeable with a harm-based assessment’. Second, we can distinguish between different kinds of causes of climate change. There are (i) human actions that foreseeably increase the likelihood of climate change, (ii) human actions that unforeseeably increase the likelihood of climate change; and (iii) non-human actions that increase the likelihood of climate change. In this post, you focus on (i) and (ii), and I’m interested to know if there is a reason for this. Second, regarding non-human actions increasing the likelihood of climate change, I think we should differentiate between non-anthropogenic climate change, and natural variability in the climate from which people suffer. Regarding the former, it is quite safe to assume that the global warming and resulting climatic changes that we now face are fully human-induced. The IPCC estimates that natural causes (changes in the input of solar energy or volcanic eruptions) contributed -0.1°C to 0.1°C to the warming from 1951 to 2010. Global warming and climate change can thus be traced back virtually entirely to human activities (and most importantly, the emission of greenhouse gases). The question of natural variability is somewhat more complex. Storms, floods, hurricanes, droughts and heat waves occur naturally as well, and people clearly suffer from their occurrence. In most cases, anthropogenic climate change tends to increase their frequency and intensity, thus increasing suffering. This is why I always qualify that “greenhouse gas emissions increase the risk that vulnerable people suffer from climate change harms”. If a bad situation needs to be resolved, our intuition says that the burdens should be borne by those who were involved in its causation. Regarding anthropogenic climate change, this intuition returns in the “Polluter Pays Principle”, which brings us to the question whether individuals can be held responsible for the contribution of their emissions to increasing the risk of climate change harms. This does not mean that we should not provide aid to prevent or relieve suffering caused by naturally occurring phenomena. Of course we should, but this duty has a different source (for example, common humanity or compassion), which also means we should find another principle for allocating these costs. This raises many interesting questions, too many to take up in these series I am afraid. Thanks for this thoughtful reply, Wouter. I now see why you distinguish non-human actions that increase the likelihood of climate change from human actions that increase the likelihood in climate changed. However, you’ve not said much about whether we should treat as equivalent (i) human actions that *foreseeably* increase the likelihood of climate change and (ii) human actions that *unforeseeably* increase the likelihood of climate change. I’m inclined to think that we should respond to (i) and (ii) very differently – at least under some conditions – but, on the basis of your post, it seems you disagree. I’d be interested to hear much more about why. As you say, though, perhaps that’s for another day. Hi Tom, I am sorry for the delayed reply, and also for misunderstanding you in only addressing non-human actions in my response to your earlier comment. Regarding the foreseeably-unforeseeably debate: first, I think we would agree that the science is sufficiently developed to give us a good picture of the actions that increase the likelihood of climate change harms. The question then becomes how to treat claims of ignorance: actions that contribute to climate change only unforeseeably do so when people are unaware of these effects. If people are ignorant regarding the harmful effects of their greenhouse gas emissions, they can hardly be held responsible. I would question whether ignorance in climate change is excusable. One can argue (as Dale Jamieson has done) that people are not culpable in their ignorance, for example because of climate change deniers and inadequate science education. I believe this justification is questionable: (1) there might be a substantial number of prominent climate change deniers, but many more public figures support and communicate the scientific consensus; (2) I think it is a horrid strategy to displace responsibility to education, as if teachers and educators fail at their jobs (OECD statistics provide evidence that they are doing a good job); (3) the basic connection between greenhouse gases and global warming has been known since the 1890s, and with 5 scrupulously researched IPCC reports, claims to reasonable ignorance have become implausible; (4) since individuals have benefited considerably from their emissions, the claim that ignorance exonerates them from responsibility loses its force. Therefore, I believe it can be reasonably expected of people to anticipate the consequences of their greenhouse gas emitting activities. It might seem that I am rather tough on people and demand too much in expecting them to be knowledgeable of climate change. However, one does not have to be a climate scientist to understand the process and there is a lot of communication to the general audience. I am afraid that ignorance is all too often appealed to as an easy excuse to evade responsibility. I believe that there are many good arguments to treat further ignorance of the effects of one’s greenhouse gas emissions as willful ignorance. But I am actually happy to hear other philosopher’s thoughts on this, since I am aware that this is a rather tough position to take.